Sourcing with us is now even more rewarding! Here is a special offer only for you. 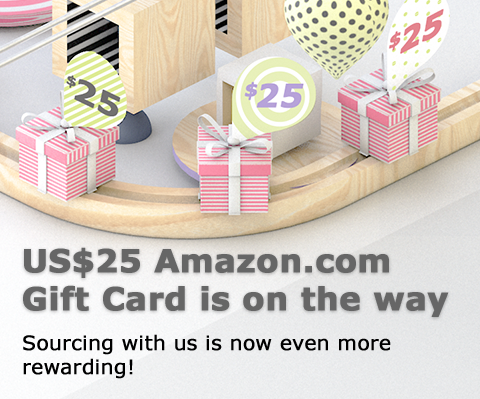 Make product enquiries to 3 suppliers via the below shortcut to earn a US$25 Amazon.com Gift Card. Why wait? Be the first 300 buyers to get the reward. • 4 phases of promotion will be conducted in 2019. The promotion cut-off date will be the end of Mar, Jun, Sep & Dec 2019. The first 300 buyers who fulfilled the requirement stated below can enter each phase of the promotion. • Buyers who contact 3 suppliers on this website will be entitled to join the promotion. • Only the first 300 buyers who successfully contacted 3 suppliers will receive the US$25 Amazon.com Gift Card. • Buyer has to provide an valid email address when contacting suppliers online in order to join the promotion. • The time of entry will be based on the record in the Hong Kong Trade Development Council (HKTDC) database. • US$25 Amazon.com Gift Card will be sent out to the first 300 entitled buyers in the form of eCard. • Gift Card will be sent to the email address provided in the enquiry form. • Please make sure a valid email address is provided. • The HKTDC is not responsible and will not compensate for undelivered Gift Card due to inaccurate email address provided by the buyer. • Each buyer is entitled to receive a maximum of one (1) US$25 Amazon.com Gift Card. • The HKTDC reserves the right to change the terms and conditions without prior notice. • In case of dispute, the decision of the HKTDC would be final and binding.